Ein prosit! This catch cry rings out in every beer tent at Oktoberfest — a toast to your wellbeing, translated to: just drink beer and you’ll be fine. Stein in hand, I joined in the singing while sat in the beer garden of the Hippodrom tent. Although I couldn’t really pronounce the words or knew exactly what I was singing, ein prosit was all that really mattered. In my very own “traditional” German outfit (or more like my interpretation of tradition courtesy of eBay) I joined my friends to experience Oktoberfest, one of the greatest festivals on Earth. There are so many words to describe what it’s like to experience Oktoberfest. To sum it up, it’s bloody amazing. Just imagine this, all the steins of beer you can drink, dress-ups, leg-slapping dancing to Barvarian big bands, immersion in culture and tradition, friendly drunk locals who definitely know how to down a stein, German sausage, gingerbread in the shape of love hearts, bread pretzels! The atmosphere is amazing. It draws you in to a place where everyone is your friend (I’m sure it’s the beer that does it). The festival which is in its 201st year, although technically it has been cancelled a total of 24 times due to the war and other things, attracts literally millions of people all vying for a seat in one of the city-sized tents. Go super early or reserve a table in advance in order to nab a seat inside. This is vital as you can’t order a beer if you are not seated. The beer garden that most of the tents have is still an amazing alternative, but if you’re keen to be seated inside with thousands of other punters singing, dancing and clinking steins, do yourself a service and get in nice and early. If it’s possible to be done with the who-ha of the beer tents, head outside to the huge carnival that adds to the festival feel. There are street parades and food and souvenir stalls intertwined along the street of beer tents. Munich itself is also a great little city to explore with an amazing food market offering huge wheels of cheese, olives, fruit, wine, dried flowers, more gingerbread and of course, plenty of other pubs in between. There is also the climb to the top of the Town Hall, which overlooks the Marienplatz for some amazing views over the city. Of course, don’t leave Oktoberfest or Munich without having schnitzel for dinner and apple strudel for dessert. There is also the Dachau Concentration Camp, located just outside of Munich. There really is nothing like Oktoberfest — a festival every Aussie should experience once in their life, or twice if lucky. It’s kind of like being down the pub with your mates, complete with a live band and a few good beers, but a thousand times bigger and more intense. 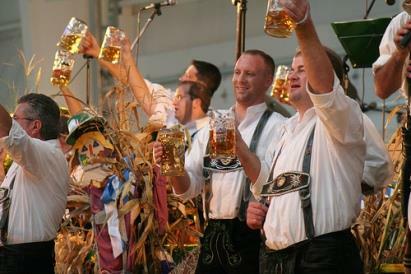 Plus, you’ll go home with some amazing memories and most probably a beer stein and your traditional Bavarian outfit. You’ll definitely want to re-live the experience back home.